I have been mostly absent from this site since the end of October and I apologize for my longer-than-anticipated leave. Jamie, the young man who works with me, has counseled me about the pitfalls of electronic media. Rule # 1 is not to be absent from your site for very long because people will forget about it, and you. I’ve broken this first, elemental rule. But in my own defense, it’s been a busy, hectic stretch of time. It began in mid-September with a weeklong trip to Kentucky and Mississippi for the American Forest Foundation. In three different locations, I photographed landowners who participate in the American Tree Farm System, picturing their involvement with their land and forests. Near Bardstown, Kentucky, I spent the day with two Trappist monks, Brothers Conrad and Bartholomew, at the Abbey of Gethsemani. We spoke at length of faith and forests as we walked and rode through the 2,600-acre tree farm they share with other resident monks. At one time over 270 monks lived at the monastery and it operated as a farm, producing most of what the monks consumed, as well as, world-famous fruitcake and cheeses. With fewer than 50 monks now, the farm mostly produces trees, which are managed for production and retreat. The Abbey was home to the Catholic scholar and writer, Thomas Merton, who I know from my Catholic youth. It was an honor to see his home and the spot that inspired much of his writing. Top, The wall of Thomas Merton's House. Bottom, left, Brother Conrad, right, Brother Bartholomew. That six-day trip was followed soon thereafter by a presentation at Wake Forest University. My talk and accompanying exhibition in the University Library was part of a larger event surrounding the screening of the film, Over Home: Love Songs from Madison County. The film, by Kim Dryden and Joe Cornelius, looks at the evolution of a cappella ballad singing, for which Madison County is a source community. Sheila Kay Adams, the county’s gifted balladeer, storyteller, and writer, is the protagonist in the film and an old friend. I came to the project through my early (ca. 1970s) photographs of singers and musicians in the Sodom community of Madison County, some of which are used in the film, and my continued documentation of the county’s lifestyle and changes, including images of music and the arts. Sheila Kay Adams, Sodom, Madison County, NC, 1975, from SodomSong. From Winston-Salem, I continued on to Duke University and a series of classes, workshops, and lectures as part of my role as a Visiting Artist for the current school year. One of the lectures was at Perkins Library in the Rubenstein Rare Book & Manuscript Library. The Library has a significant archive of documentary photography and will eventually house my archive. It’s a perfect venue – small (seats 75,) intimate, couches and comfortable chairs, and good sound – and it was full with a nice mix of students, faculty, and staff. My talk was titled, Bloody Madison, ShatterZone, and the Jewel of the Blue Ridge, and looked at the demographic, cultural, and environmental evolution of Madison County. Greg Mosser Singing at Jamie Paul's Birthday Party, Marshall, Madison County, NC, 2010, from ShatterZone. I returned home for about eight days and then left on a ten-day trip for the Forest Foundation. This trek took me to the northeast and work with another group of tree farmers. My first stop was with Mike and Vivien Fritz who live just west of St. Johnsbury, Vermont, on a beautiful piece of land they’ve groomed with twenty-five miles of cross country ski and snowshoe trails that are open to their entire community for use. From the Northeast Kingdom of Vermont, I drove through the White Mountains in New Hampshire that boast Mt. Washington, second only to North Carolina’s Mt. Mitchell as the tallest peak east of the Mississippi River, and onto the North Family Farm in Canterbury, New Hampshire. Tim Meeh and Jill McCullough’s place had been part of the original Canterbury Shaker Village that dated back to 1792 and the landscape remained rich with the Shaker’s presence – stone walls and boundary markers, mill traces. Tim’s father bought the place in 1950 and it has been a family farm since then. Tim and Jill make syrup from 2,000 tapped maples, sell hay and firewood, and operate completely by wind and solar power. I stayed in their basement apartment for two nights and we found much in common from our present lives, as well as, a shared past from the late sixties and early seventies. It is so nice to be on the road and wind up in a place where you immediately feel at home. Top, Tim Meeh & Jill McCullough. Bottom left, Replacing sap lines, right, their barn. 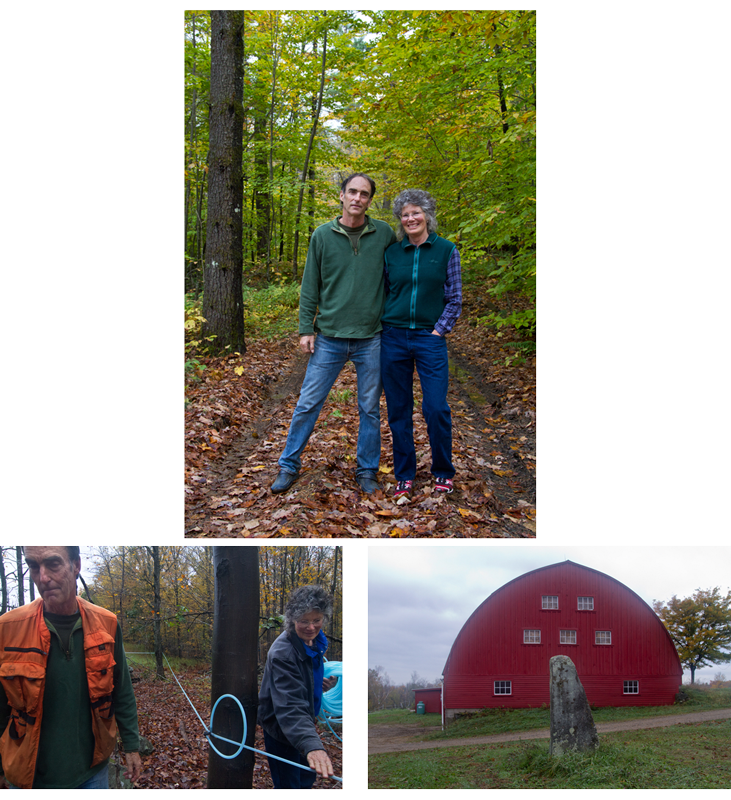 From the Shaker Village, I drove across New Hampshire, which isn’t very far, to visit with Ben and Debbie Kilham on their Tree Farm near Lyme. The Kilham’s also make maple syrup, and operate a small saw mill, but Ben is mosly noted for his work with orphaned black bear cubs. He is the state’s certified bear rehabilitator and often has as many as twenty bear cubs roaming in a fenced eight-acre lot behind his house. This stop featured my first, and probably last, opportunity to have a 100-pound cub rubbing its back against my chest. Ben is doing amazing work with orphaned cubs, all of which are released into the wild, and his long-term studies of black bear behavior have broken new ground in our understanding of these incredible creatures that, as Ben’s research has discovered, share more traits with humans than one might imagine. Top, Ben & Debbie Kilham, Middle, left, Discovering a bear den while in the woods marking trees, right, Ben and his sister, Phoebe, walking to the food plot, Bottom, Ben feeding his cubs. This post will be followed in a couple of days by "Absent #2."